Having spent most of my career in the insurance and investment industries, I have seen more than my fair share of reports, studies and analyses seeking to explain investments and investor behavior. Most are mind-numbing in their complexity and are rarely worth an investor’s time. That’s why I prefer to explain financial concepts in common-sense terms, using everyday analogies where possible. Most investors know a lot more about what goes on in the world around them than they do about the latest market analysis, so if we can explain financial concepts in terms they understand, then it might stick with them a while longer. This article will attempt to address why so many investors who lost money in 2008 (and some in 2002) still cling to passive investment portfolios. Here’s what I think. 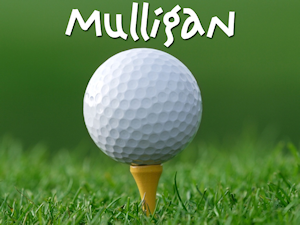 I’m not much of a golfer, but the few times I have played taught me the need for a “mulligan.” According to my golfing buddies, a mulligan is essentially a do-over where your last shot doesn’t count against you. So how does this concept apply to investors who stubbornly hold on to passive investment strategies? Let me explain. I was recently talking to a neighbor and, knowing I’m in the investment business, she began discussing her own portfolio. She was bragging about how well her large wire house broker had been doing over the past few years and how pleased she was with his guidance. So I asked about how her broker managed risks and if she had lost money in 2008, during the height of the bear market. She admitted that she had lost money big-time in ‘08, but justified it saying that everyone did poorly during that period of time. In other words, her broker got a mulligan for poor performance during the financial crisis. As we all know, in 2008, almost every asset class not only lost money, but lost big. Between October 2007 and March of 2009, the S&P 500 Index lost more than 50% of its value. Since then, however, the Index has rebounded over 100% and reached new highs thanks to a large dose of easy money from the Federal Reserve Bank. The result? Investors remember the recent upward trend and give the market a mulligan for 2008. There’s only one big problem. As my friends soon found out about my skill on the links, a lousy golfer seldom needs just one mulligan. The same is true of passive investment strategies. For proof, you need look no further back than the first decade of the new millennium, in which the major stock indexes needed two mulligans in less than 10 years. Do you really think those will be all it needs going forward? I doubt it. That’s why it’s important for investors to compare where they are in relation to their investment goals, including mulligans, and where they should be to be on track with their original investment plan. Investors are often sidetracked by the financial media’s claims of “record highs” when all it really means is that they got back to breakeven. They should be paying more attention to risk management. By focusing on the progress of an investment plan that includes actively managed strategies to reduce the effects of bear markets, investors can more clearly see how detrimental these do-overs can be. After all, you won’t be able to get a mulligan if you miss retirement goals.